The Fairey Fawn was a British single-engine light bomber of the 1920s. It was designed as a replacement for the Airco DH.9A and served with the Royal Air Force between 1924 and 1929. The Fairey Fawn was designed by F Duncanson of Fairey Aviation as a replacement for the Airco DH.9A in the light day bomber role, to meet the requirements of Specification 5/21. It was a development of the Fairey Pintail floatplane, powered by a Napier Lion engine. The first of three prototypes flew on 8 March 1923 . The second and third prototypes were fitted with lengthened fuselages to improve stability, and this was adapted for the production version. The Fawn was fitted with fuel tanks above the top wing in order to meet Air Ministry safety requirements. These tanks posed a hazard to the pilots if the aircraft overturned on landing. 50 were ordered in August 1923 to re-equip the home based DH.9A squadrons of the RAF, with the first two being completed as short fuselage Fawn Mk Is and the remainder of this order being full production long fuselage Fawn Mk IIs. The Fawn Mk III was fitted with a more powerful 468 hp (350 kW) Lion V engines, while the Fawn Mk IV was fitted with a supercharged Lion VI engine. The Fawn entered service with 12 Squadron in March 1924, equipping two further regular squadrons, 11 Squadron and 100 Squadron . Despite the fact that the Fawn was originally intended to replace all the home-based DH.9A squadrons, four more squadrons continued to be equipped with the DH.9A for several more years before being replaced by other types. The Fawn was not a popular aircraft in RAF service, having little better performance than the aircraft it replaced, and having a poor view for the pilot owing to the bulky Lion engine . The Fawn was replaced in these three regular squadrons in 1926, being replaced by the Hawker Horsley and the Fairey Fox. 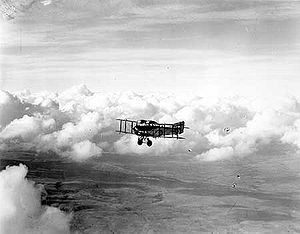 The aircraft freed up were used two equip two Special Reserve and Auxiliary Air Force squadrons, these remaining in service until 1929. Long Fuselage - 450 hp (340 kW) Lion II engine. Main production type - 48 built. 468 hp (349 kW) Lion V engine. 15 built. 520 hp (390 kW) supercharged Lion VI engine. 5 built. Up to 460 lb (209 kg) bombs underwing.